SEO software are specifically designed to help you in staying ahead of your competitors and capitalize on your SEO enhancing efforts. These software offer multiple benefits to your business such as analysis of keywords, pinpointing popular links, link exchange, research and many other features. They also offer assistance in organizing and emphasizing numerous pages so that your SEO investment stays on the right track and help you to improve your search and page rankings drastically. They also save a lot of time and effort and reduce manual labor in order to boost efficiency. 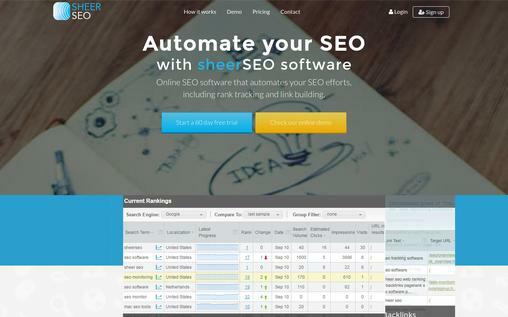 Here is a list of such 10 Best SEO Software that are “Best for Business”. Web CEO is one of the most award winning SEO software. It had been a champion since 2000 and has more than 500,000 customers worldwide. With numerous features and outstanding SEO tools, it also offers various B2B Solutions for larger organizations. In spite of such great features, Web CEO offers attractive packages at a very affordable pricing range. 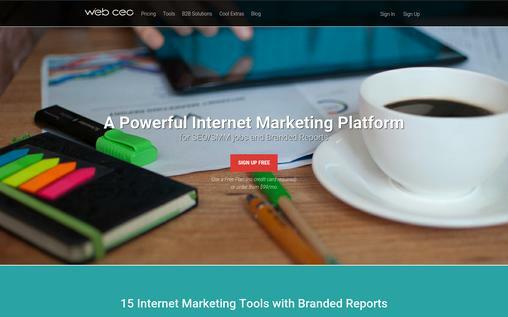 Web CEO offers a range of 15 different tools and provides scheduled branded SEO reports that can be emailed and published as well. Built-in keyword suggestion tool to help you choose the best keywords and phrases. You can use this White Label SEO Tools on your own domain. It offers link building tools to manage your inbound and outbound links. Landing Page Analysis feature evaluates every landing page to understand how much effective it is on search engines. It also provides a full report about all your wasteful links that are related to blocked pages or redundant pages. Offers in-depth analysis of up to 20 competitors to stay one step ahead of them. It offers a Free Version and the package starts from $75/month which is absolutely customizable. It helps to analyze incoming and outgoing links, find broken links and redirects, escape duplicate content: Titles, Meta Descriptions, H1 Headers. It also presents all the data in graphics and diagrams. It has 14 days of free trial with no limits to a tool, and the package starts from $9.80 per month. 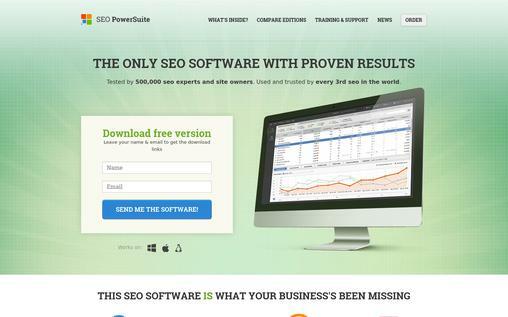 SEO PowerSuite is an amazing software that provides 4 immensely powerful SEO tools that works wonder. Highly appreciated by many professionals. It also offers amazing performance at a very inexpensive pricing range. Tensed about your current page ranking? SEO PowerSuite will help you to boost your ranking on 300+ search engines. It offers 17 effective keyword research tools and also helps to examine up to 10 competitor’s website. The keywords suggestion tool of PowerSuite gathers data from Google Adwords and WordTracker. SEO Spyglass tool helps you to analyze each and every backlink that points out any website. One can immediately identify and neutralize any harmful backlink that might be the result from negative SEO of your competitors or wrong moves related to link building. You can also utilize Proxy Settings in case of any requirement and work unnoticed. Works flawlessly on any Operating System and offers 8 different interface languages. The professional licensed package starts from $299 for lifetime and you can download the Free Version as well. SEO Suite is a premium high end SEO management software which is a super effective combination of more than 25 tools. It helps you to optimize websites and integrate both the software namely Web Ranking Software and software for Dynamic Submission as well as many other features. Also, its Corporate Edition is specifically designed for agencies and larger corporate. It gives you unlimited number of keyword suggestion and helps you to choose the best one for you. Thera are many tools through which you can build and manage quality backlinks. It has comparison and competitor analysis tools to analyze the links of your competitors. Examine your page ranking with respect to any keyword and website. SEO Suite automatically builds keywords around any master keyword that you look for. It provides SEO, keyword ranking and submission reports. You can buy the standard package starting from $119.95 for lifetime. 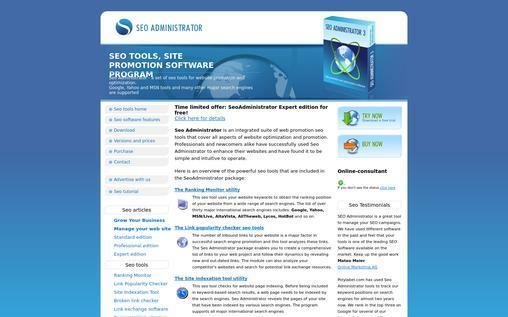 SEO Administrator is a combination of SEO tools for web promotion that cover every feature of website promotion and optimization. It has ranking monitor utility facility that examines your page rank in a multitude of search engines and determines your current position. SEO Administrator also offers Log Analyzer that is designed for understanding website log files. It also has HTML Analyzer that examines HTML Pages and provides preliminary analysis of your website. Checks the number of incoming links of your site using Google PageRank. It helps you to create a massive link list related to your web project and analyze their dynamics by finding new and throwing out useless links. You can survey your competition’s links and build your own SEO program. The site indexation tools help you to index your web page by various search engines so that it gets more visible in keyword based search results. It also uses various trusted sources to extract the most relevant and powerful keyword for every page of your website. 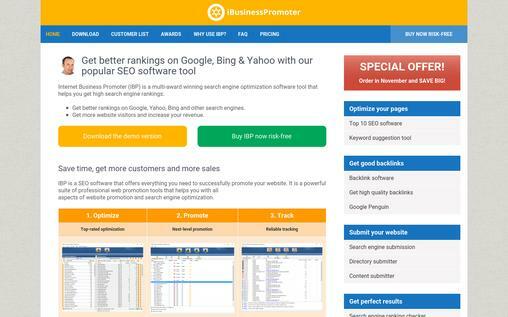 iBusinessPromoter is a world class multi award winning SEO software that will help you to boost your page ranking on any search engine. Highly rated and reviewed, IBP helps you to increase the traffic on your website. Skeptic about Black Label software? iBusinessPromoter is a White Label software that has been used since 1997. It has amazing features and is very light on the pocket. IBP analyzes your web page for your chosen keyword and search engine and helps you to improve your web page ranking by proving you detailed advice. With IBP, you will get powerful tools for keyword research and analysis, web page optimization, link building, website submission, website rank check and much more. You can create professional, customizable (even with your company logo) SEO reports for your clients. Supports all popular search engines and their algorithms. It helps you to get high-quality backlinks that lead to high google ranking. The package starts from $249.95 for a lifetime and you can also get a full refund if not satisfied. Tired of looking for different software for different SEO purposes? Sheer SEO offers you multiple SEO features such as Backlinks Management, white labeled SEO reports, Social Tracking and much more at an amazing price. It even tracks and preserves historical data for your clients and serves as referral points when required. Guard your backlinks, review blogs and perform Directory submissions effectively. Analyze the keyword density and provides you the in-detail report in colored charts and graphs. It monitors your social media comments, shares and link that influence your Google Page rankings. You can export your data in different formats. 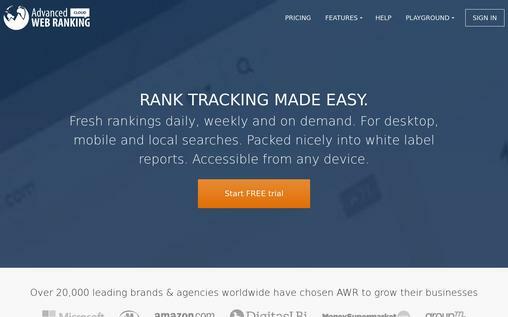 For search engines like Google, Bing, and Yahoo, there is a rank tracking software that determines the search volume and real data traffic. OnPage SEO feature helps you to optimize your pages according to specific keywords. Get an instant alert if anyone tries to modify or drop your backlinks. Starting from $7/month, you can also try 2 months of free sign up. The SEMrush SEO Software is an unrivaled global expert in SEO, PPC and Marketing specialties. It helps you to quickly build your backlinks and increase your search traffic. 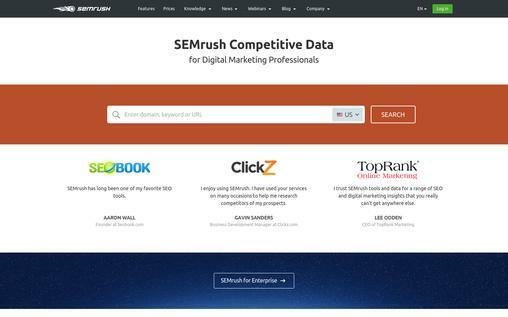 SEMrush provides Advertising Research, Backlink Checker, Product Listing Ads, Position Tracking and many other amazing features. Helps you to find the right keyword and phrases for SEO and PPC campaigns. Get a peek through at your competitor’s keywords and identify latest organic competitors whose page rankings are superior than yours organically. It helps you to conduct a deep link analysis. You can easily localize your Ad Campaigns and also examine your competitors marketing strategies and budget. Launch worldwide campaigns, track domains and keywords, Audit your website’s SEO position as well as monitor your brand’s reputation. Its packages start from a very nominal price of $69.95/month. Advanced Web Ranking SEO software has been chosen by more than 20,000 leading brands and agencies worldwide. It is absolutely user-friendly and is compatible with every device. Tired of paying for any extra feature that you use? Well, with Advanced Web Ranking, you can create unlimited campaigns and scrutinize numerous competitors’ websites without paying any extra cent. It helps you to find the best keywords and phrases that are most likely to optimize your site. The link exchange tool finds the reliable and relevant link partners to increase your page rank. Its competitor analysis tool gives you an insight of up to 10 competitors. Identify localized rankings with absolute accuracy, grant access to campaigns to an unlimited number of clients and white labeling reports for monitoring your ranking position. You can also use special characters to track keywords in Cyrillic, Hebrew, Latin, Chinese, Korean or Japanese without any extra settings. Get started with a 30 day Free Trial offer on all plans without any software installation. Amazing pricing ranges starting from $49 per month. Want to enhance your WordPress sites but cannot identify any reliable software? 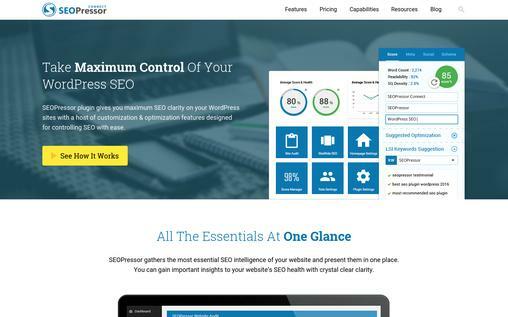 SEOPressor5 Plugins will help you to effectively customize and optimize your WordPress sites and also offers absolute SEO clarity. SEOPressor5 empowers more than 23 million WordPress sites worldwide and is highly appreciated by professionals. It can offer a complete analysis of 3 billion rows of data and thousands of page rankings. To the point analysis of your website’s SEO and keeps a vigilant check on over-optimization with the help of alerts along with full analysis of multiple keywords. It helps you to optimize up to 3 keywords at no extra cost. Comprehensive Semantic Builder helps you to improve your search relevancy without altering a single line of any code. 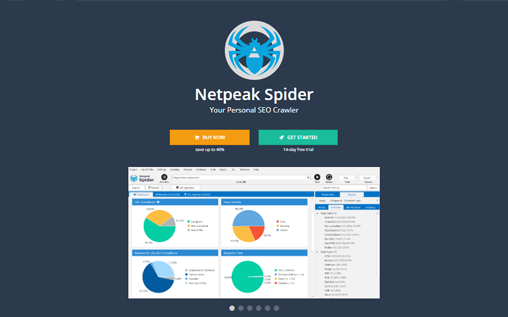 Dynamic Crawler Control helps you to gain full control over how search engine crawlers steer through your website. It will also offer better website indexing control. Connect at only $9/month price. 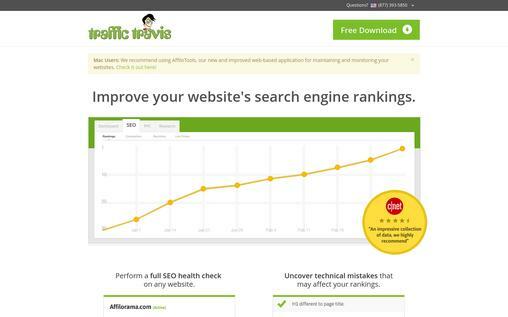 Traffic Travis is a premium SEO software that offers complete SEO solutions for your website. It helps you to identify and correct any technical error that can severely affect your page ranking or may result in faulty backlinks. Traffic Travis dashboard has all your important metrics visually available in a single place. It links with Google Adwords to bring you the keyword information directly from Google. Backlink analysis helps you to develop and build more backlinks. Keyword spotting helps you to understand on which keywords are your competitors investing and target them. Examine your rankings according to different search engines and focus your efforts accordingly. SEO reporting tool allows you to view and export reports in CSV or PDF files. You can easily download standard version for Free, however pro version comes at $97 per year. SEO software is assisting E-commerce industry at a whole new level. If you have an internet based business model, these software will help you to promote yourself on various search engines and boost your revenue margins radically. So opt for any of these software and be the first one to grab your audience’s attention.